A magnetic stirrer or magnetic mixer is a laboratory device that employs a rotating magnetic field to cause a stir bar (also called "flea") immersed in a liquid to spin very quickly, thus stirring it. The rotating field may be created either by a rotating magnet or a set of stationary electromagnets, placed beneath the vessel with the liquid. Since glass does not affect a magnetic field appreciably (it is transparent to magnetism), and most chemical reactions take place in glass vessels (i.e. see beaker (glassware) or laboratory flasks), magnetic stir bars work well in glass vessels. On the other hand, the limited size of the bar means that magnetic stirrers can only be used for relatively small (under 4 liters) experiments. They also have difficulty dealing with viscous liquids or thick suspensions. For larger volumes or more viscous liquids, some sort of mechanical stirring is typically needed. 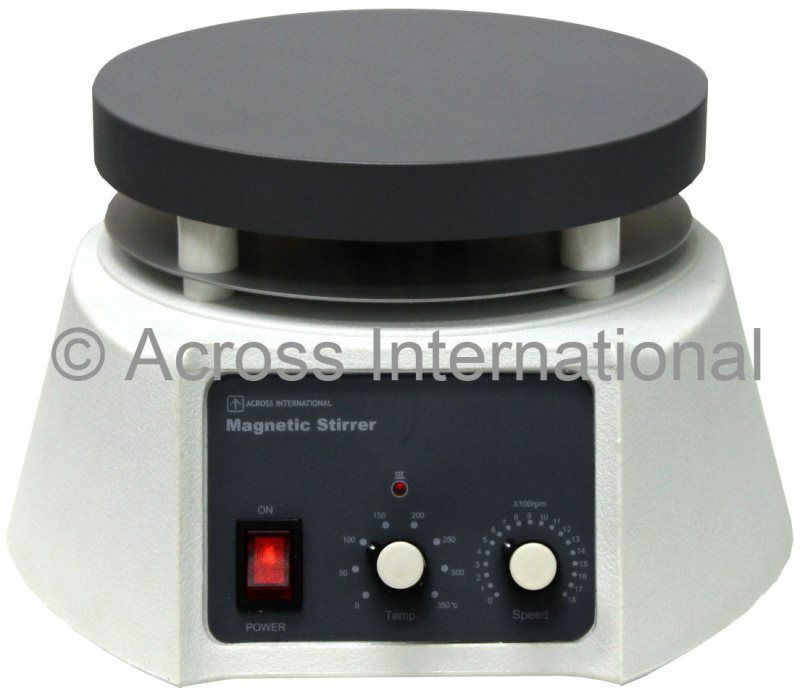 Magnetic stirrers are often used in chemistry and biology. They are preferred over gear-driven motorized stirrers because they are quieter, more efficient, and have no moving external parts to break or wear out (other than the simple bar magnet itself). Because of its small size, a stirring bar is more easily cleaned and sterilized than other stirring devices. They do not require lubricants which could contaminate the reaction vessel and the product. They can be used inside hermetically closed vessels or systems, without the need for complicated rotary seals. Magnetic stirrers may also include a hot plate or some other means for heating the liquid.